Hurray! Weekly model drawing has started at the Ludington Area Cultural Arts center. I am so happy! I love drawing people! Now I get to do it every week! Here are my drawings from today’s session. These are charcoal on newsprint. If you’re interested in any of them, send me an email. 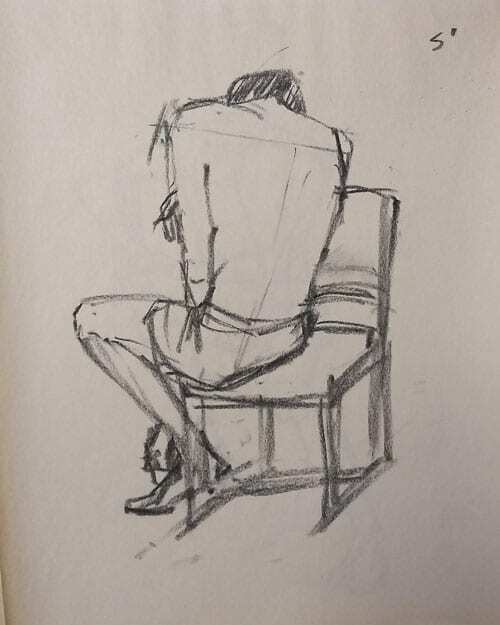 Figure study, seating man, 15′ charcoal on newsprint, approx. 17×14″. 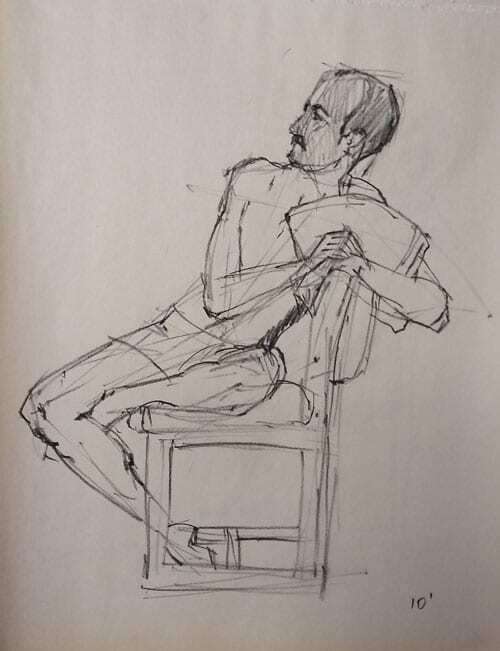 Figure study, seated man, 17×14″ newsprint and charcoal, 20 minutes. 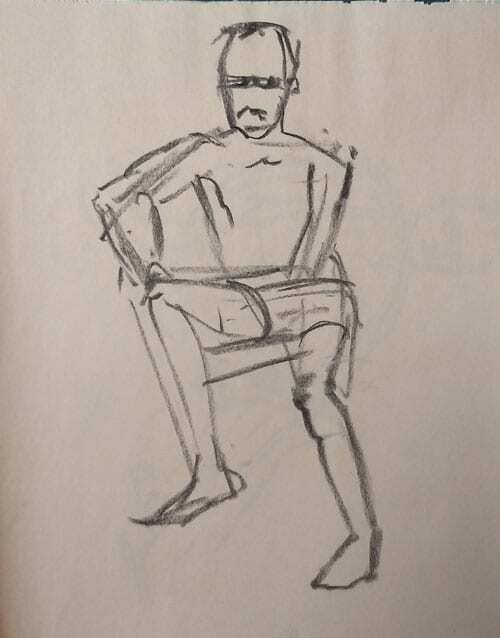 Figure study, seating man, 10′ charcoal on newsprint, approx. 17×14″. 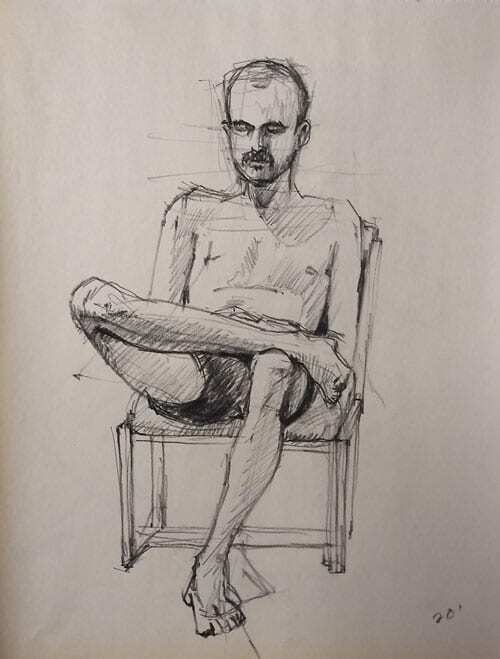 Figure study, seating man, 5′ charcoal on newsprint, approx. 17×14″. 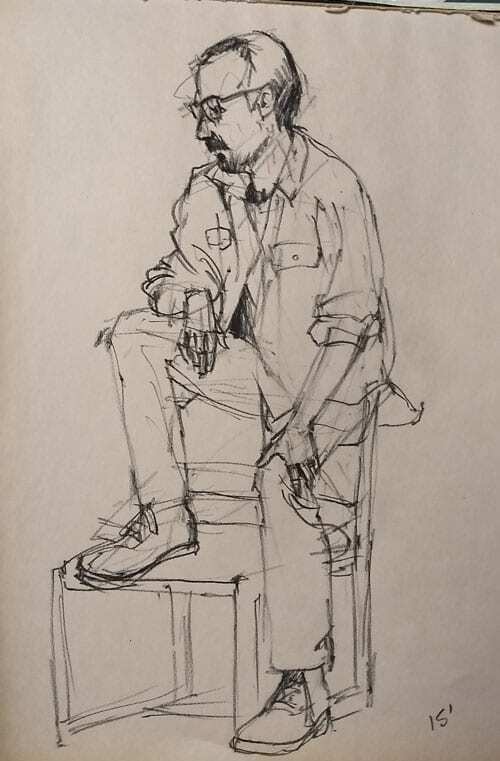 Figure study, seating man, 13′ charcoal on newsprint, approx. 17×14″. 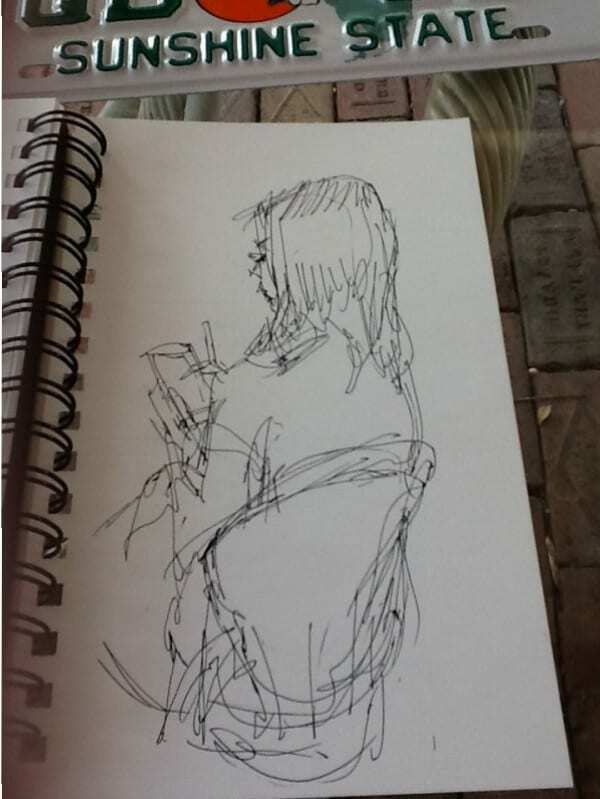 Figure study, seating man, 2′ charcoal on newsprint, approx. 17×14″. 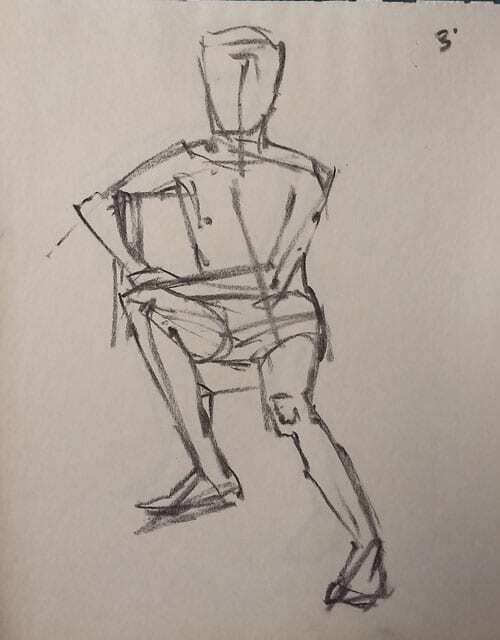 Figure study, seating man, 2′ each, charcoal on newsprint, approx. 17×14″. 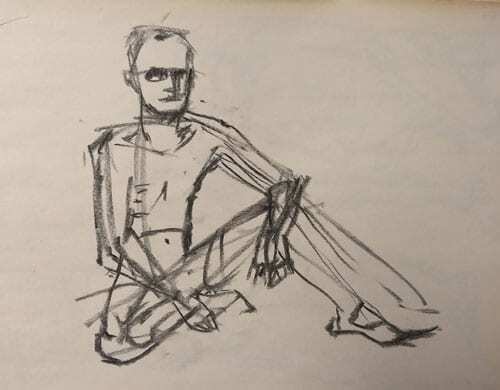 This entry was posted in charcoal, Daily painting, Figure study, figures, painting a day on December 12, 2018 by Marie Marfia. Sitting on a Log, 5×7″ pastel on sanded paper by Marie Marfia. $90. This little painting is about sitting on top of a log in the middle of the Manistee National Forest. Steve and I had gone walking around a potential camping spot near the Pere Marquette River and started wandering along a deer path. Deer seem to pick out the prettiest places to walk along. Anyway, we came across this huge tree across the path and naturally, Steve wanted to climb aboard and pose for a picture. I love living around here. This is one of my daily paintings. If you would like to purchase it, please email me. 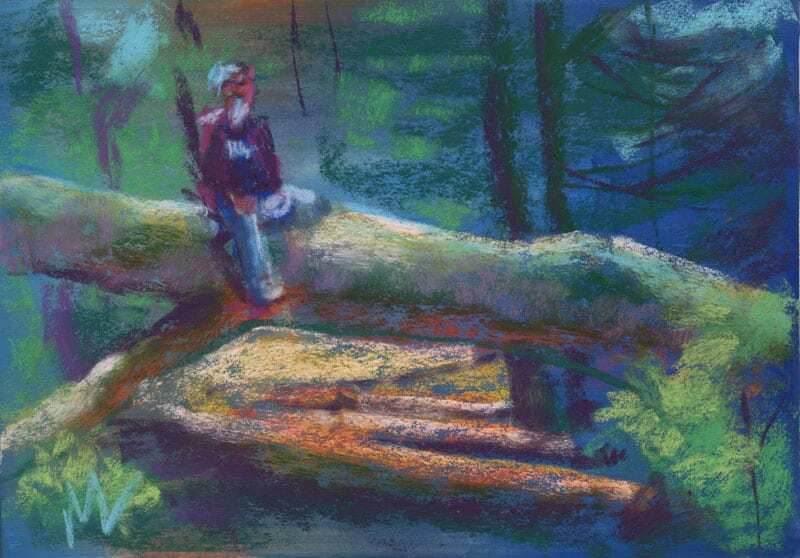 This entry was posted in A pastel a day, figures, Landscape, painting a day, Pastels, Woods scape and tagged deer, forest, log, man, path, sitting, tree, woods on April 25, 2017 by Marie Marfia. 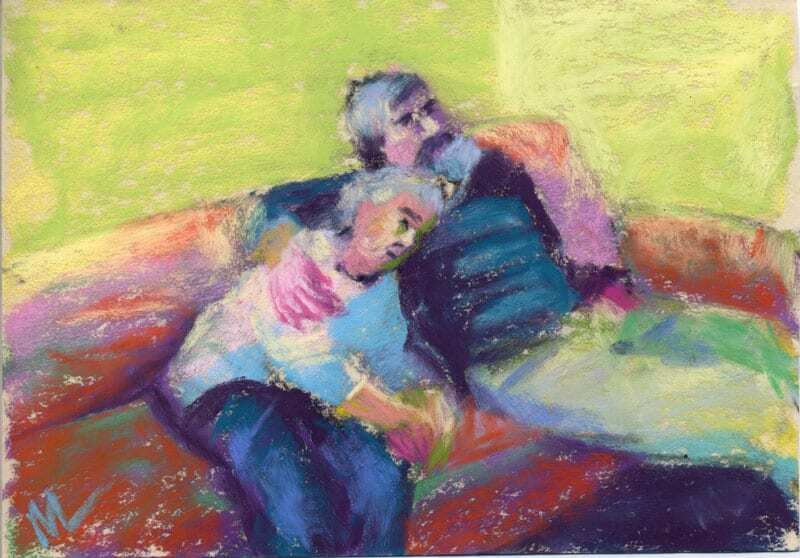 This study is done from a photo that I took last Christmas of Steve and his mom, Diana, on the couch at my daughter’s place. She was just resting on his chest while watching some movie on TV. I wonder if she was pretending he was someone else. Diana has dementia. She’s living in an assisted living facility. She has her own apartment, a two bedroom with a kitchenette, although she doesn’t cook anymore. She walks down to the dining room for her meals. When she’s walking back to her apartment she always says she lives in outer Mongolia because it’s such a long way away. Diana doesn’t always remember who we are when we come to visit, so we always tell her as we’re coming through her door. “I’m your favorite daughter-in-law, Marie.” “I’m your oldest son, Steve.” That way, she doesn’t have to scramble to come up with names right off the bat. She’s pretty good at covering up her memory lapses right now, but that skill is slipping away, too, like everything else. This is a hard thing to watch. She’s always prided herself on her intelligence. She got all As in school growing up and got a Masters of Library Science. She still speaks French sometimes and likes to play Duolingo on my iPad. The place where she lives just called this week to tell Steve that she needs more care now, help with dressing herself, taking showers, doing laundry. It’s fine. Steve’s Dad made good investments and saved all his life before he died. She’s got plenty to cover the extra costs. It’s just that it’s another step down the road that you hate to have to take. We all gotta die. I get that. I wish it didn’t have to be like this, that’s all. 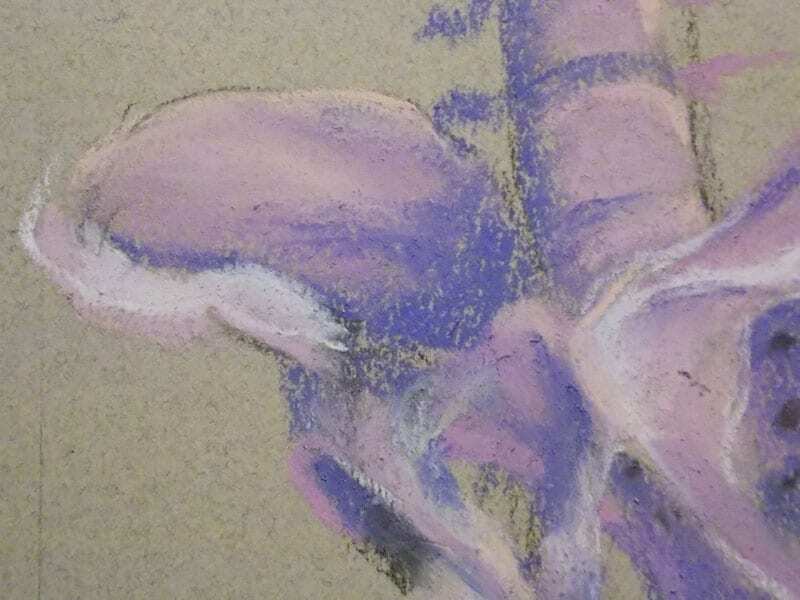 This entry was posted in A pastel a day, Figure study, figures, painting a day, Pastels and tagged Alzheimer's, dementia, family, painting, parent, pastel, son on February 24, 2017 by Marie Marfia. I decided to try to get some sketching in while I was waiting for my number to be called at the Tax Collector’s Office today. It felt kind of funny to be one of the only people out of about fifty-some that wasn’t on a cellphone. It was just me, a couple of elderly ladies, and a toddler or two. The toddlers looked like they would have liked to play on a phone. The one that was directly in front of me settled for poking at the walker belonging to the old lady next to me. I haven’t yet worked up the nerve to ask someone to let me take a picture of them to use to draw with. My friend Cynthia does this all the time. I swear I’ll do it. One of these days. This was fun, though. 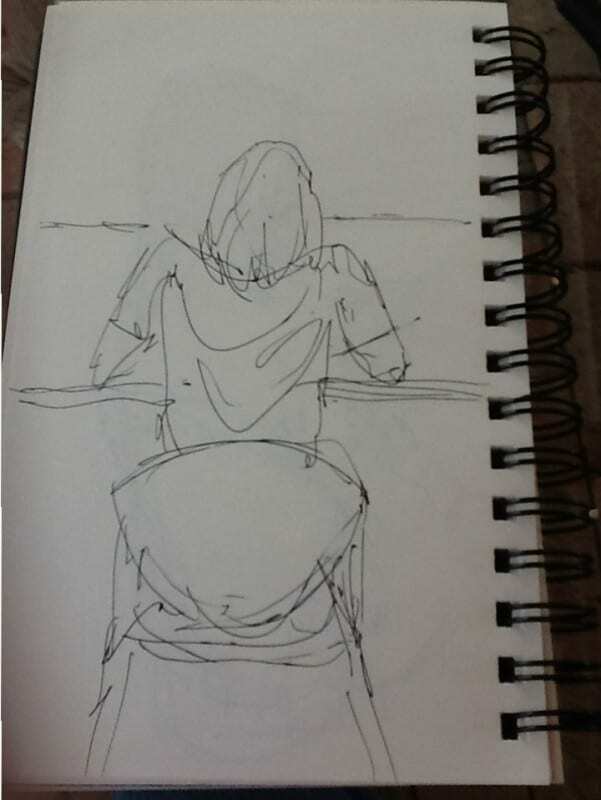 The first one is of a young woman who was intent on her smartphone. She had lightning fast texting skills. The other was of a woman leaning on the counter to my left. I liked the way her shirt draped in folds across her back. These are the first of more sketches to come, I hope. I want to do more of it, whenever I can, instead of automatically going for a distraction, like sudoku puzzles or imgur. 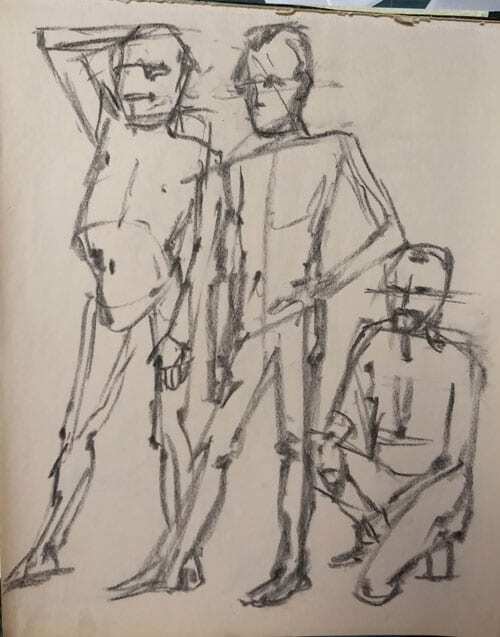 This entry was posted in figures, Gestures, sketches and tagged distraction, figures, sketch, stealth on March 7, 2016 by Marie Marfia. I painted this last week, while I was working my shift at The Attic. I liked the contrast between the woman’s dark skin and the bright bikini and really, really liked both against the cool blues of the water. She was so relaxed, sitting in the surf and letting the waves wash over her. I think I was wearing shorts or jeans or something and I remember feeling a little jealous. Why wasn’t I sitting in the water like her? Yellow Bikini, matted and framed, $269. 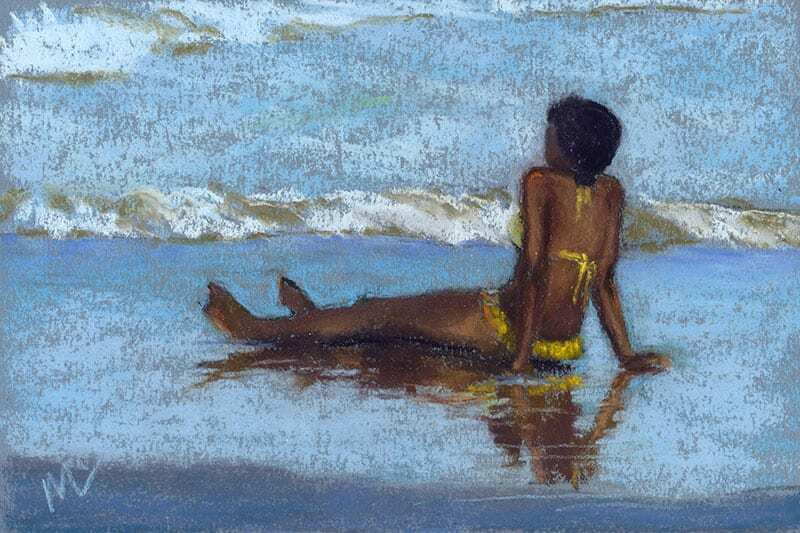 Yellow Bikini, 6×9″ pastel on paper, matted and framed, $269. 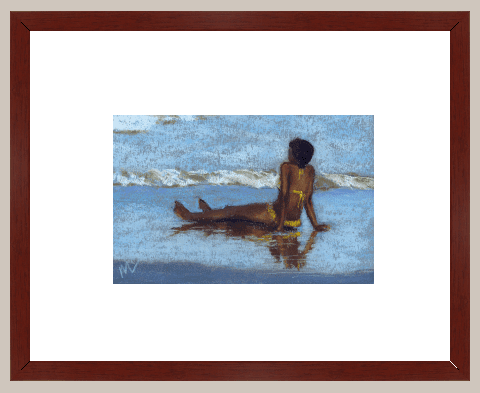 This entry was posted in A pastel a day, figures, seascape and tagged art, beach, bikini, blue, brown, figure, painting, pastel, woman, yellow on February 23, 2016 by Marie Marfia. This is a quick study from one of my very favorite pictures of Sam and Nick. They were probably 5 and 8 years old. Sam has his hands in his ears and Nick has a smile on his face. We were at Stearns Beach in Ludington, Michigan, probably late in the day. I used to haul the kids to the beach nearly evening during the summer, starting in May. I remember the white imprints of small feet by the back door, made from Johnson and Johnson’s Baby Powder and beach sand, a mixed media artwork that lasted all summer. Here’s a time-lapse video of my practice this morning. I apologize for all the times my face got caught crossing in front of the camera. I’ll remember to put either my pastels or the camera on the other side next time. This painting is available at auction on ebay starting tonight at 9pm eastern. 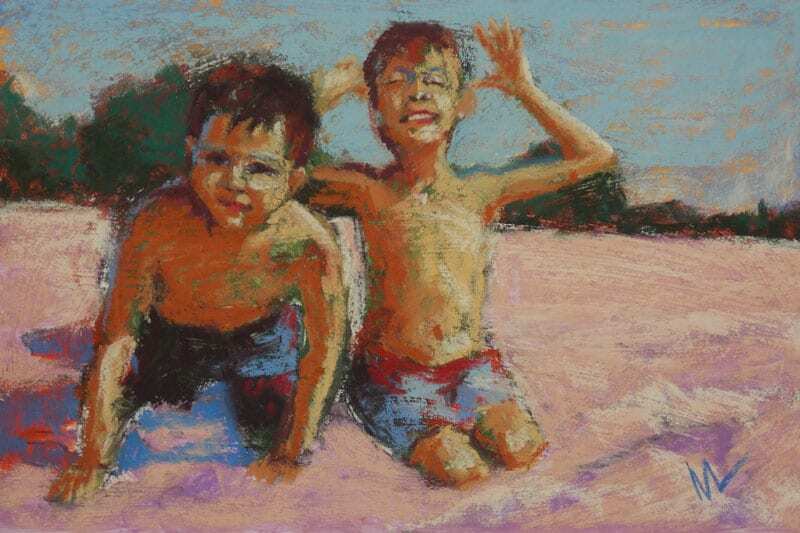 This entry was posted in A pastel a day, figures, painting a day, Pastels, portraits, seascape and tagged art, beach, boys, children, painting, pastel on January 21, 2016 by Marie Marfia. Here’s a pastel of my husband, Steve, loosely rendered. He’s looking for shark teeth on the beach at Mickler’s Landing, in Ponte Vedra, FL. 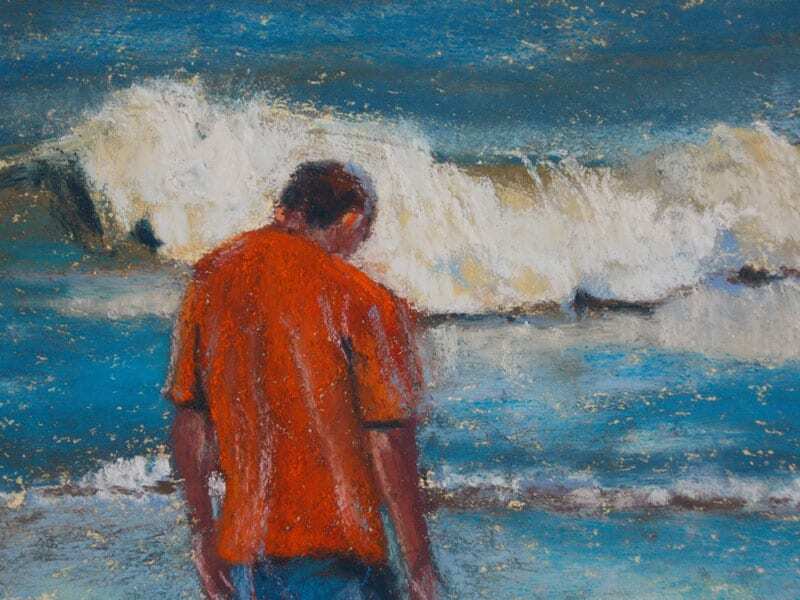 I loved the contrast between the hot orange of his shirt and the deep blues of the surf. The sun was low in the sky for this picture and so all the foam was creamy where the light hit it. Delicious! After the craziness of all those portraits, it’s kind of nice to relax and do some low key painting for a while. Since my life is only going to get more hectic as I go, what with getting our house ready to sell and moving back to Michigan, I think I’ll do beach scenes for a while. They’re calming, a good place to put my head. This painting is available on ebay beginning at 9pm eastern time tonight, January 15, 2016. 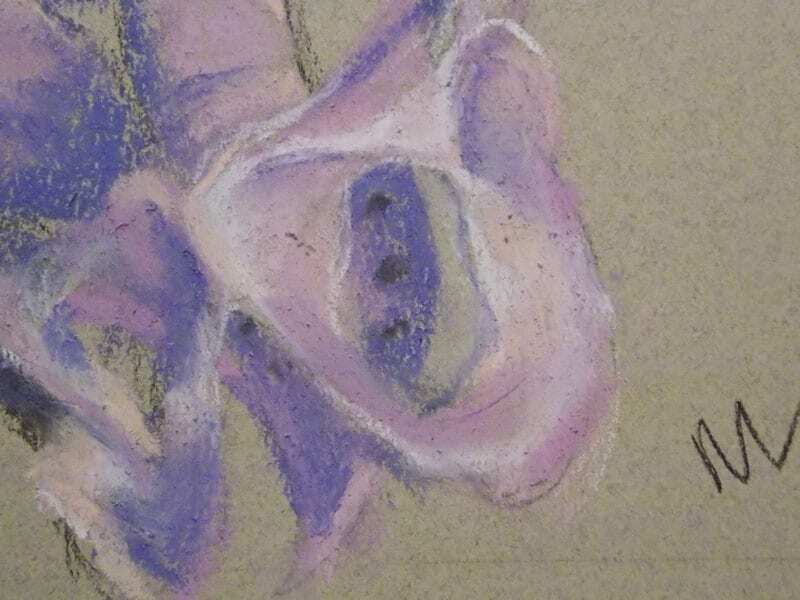 This entry was posted in A pastel a day, figures, painting a day, Pastels, seascape, Uncategorized and tagged art, beach, painting, pastel, shark teeth, shoreline, surf, wave on January 15, 2016 by Marie Marfia. Another in the series of human bones. It reminds me of a butterfly from this angle or maybe a ram’s skull or a bird in flight. 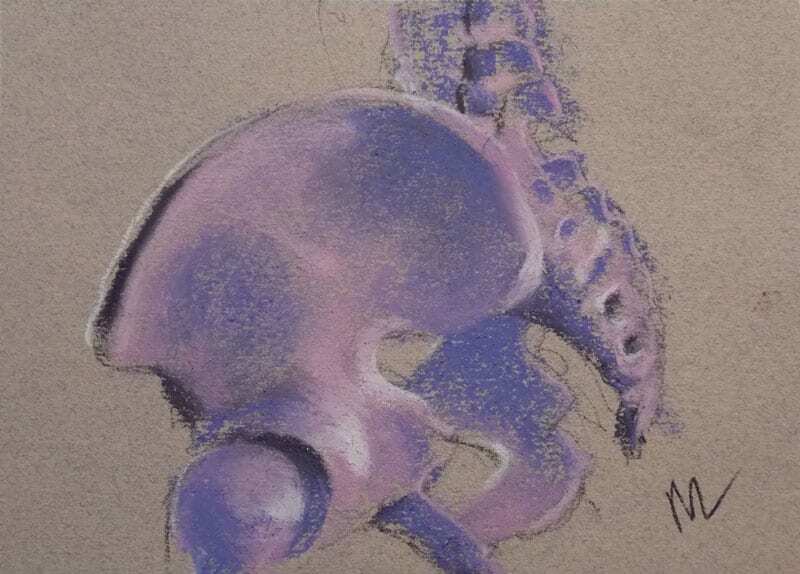 Pelvis 3, 5×7″ pastel on paper by Marie Marfia. 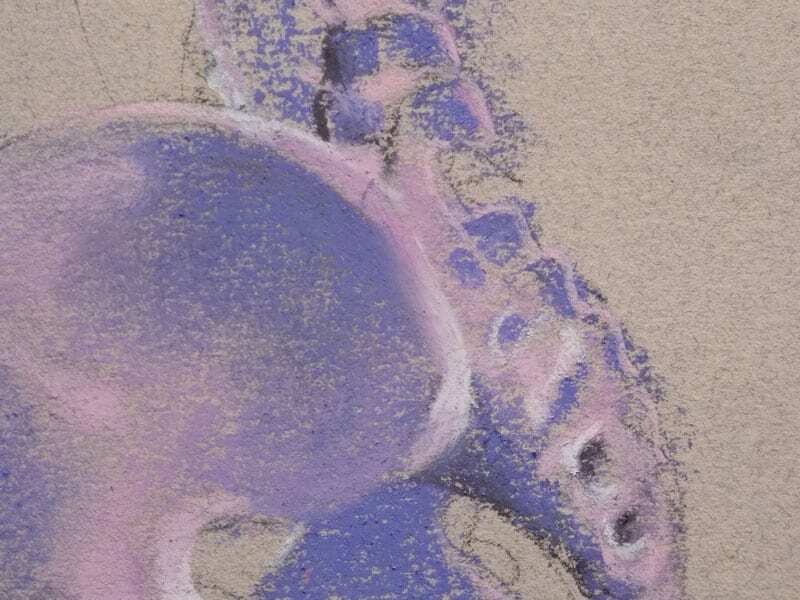 Pelvis 3, detail, 5×7″ pastel on paper by Marie Marfia. Someone asked me today why I paint skeletons and bones. My first thought was, they make me laugh. Well, these don’t exactly make me laugh, but they are a challenge. Bones. You think you know them, but you don’t, really. They’re hidden from your sight, unless you’re a surgeon or you happen to see someone’s broken bones or you look at them on an x-ray. Even then, they’re not your bones. Bones are what I hang my me on. Without them, I’d be a puddle of flesh on the floor. I don’t give my bones enough credit for holding me up, giving me shape, form. But they’re there, inside, doing a lot of hard work. And they’ll still be there, long after I’m gone. Bones last. 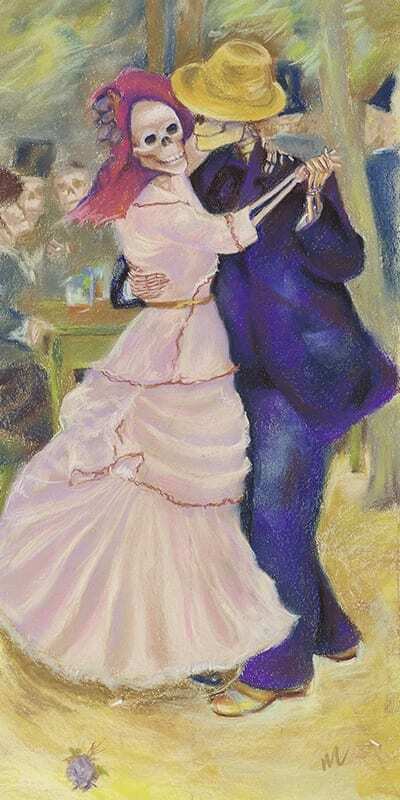 If you’d like to purchase this pastel, it’s available at auction on ebay through November 2, 2015. After that date, you can contact me via email about availability, payment and shipping. Have you signed up for my newsletter, Bone Appetit? Click here and you’ll receive a free, printable notecard featuring “Hello Sailor,” along with weekly emails containing the best of my blog, plus subscriber-only offers on prints and originals. What are you waiting for? Sign up! 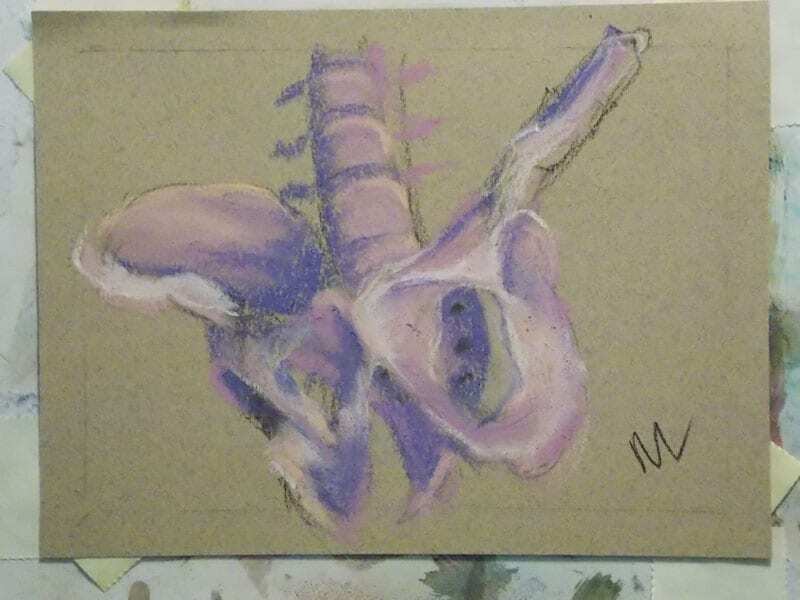 This entry was posted in A pastel a day, Figure study, figures, painting a day, Pastels, portraits, Skeleton and tagged bones, pastel, pelvis, portrait, skeleton, Study on October 23, 2015 by Marie Marfia. What kind of music do you suppose they’re dancing to? A two-step? Fox trot? East Coast swing? 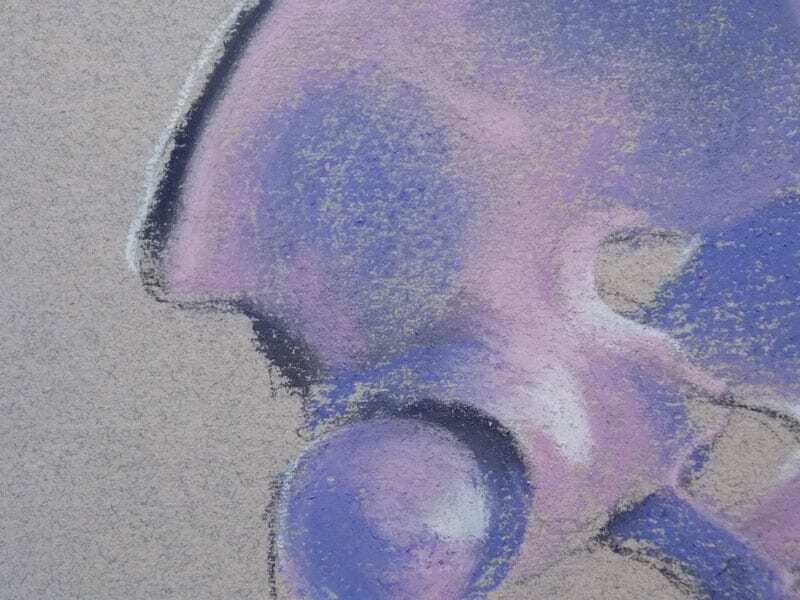 This entry was posted in A pastel a day, figures, Skeleton and tagged Marie Marfia, pastel on July 8, 2015 by Marie Marfia.